Please click here for information on how to help pets displaced by the fires burning in Northern and Southern California in November 2018. The deadliest wildfires in state history continue to burn in California’s wine country, destroying more than 120,000 acres. Over 30 people have died so far, and hundreds remain missing. Thousands of people have lost their houses, and shelters are taking in their pets until they have a place to call home. Here are some of the ways you can help them. The Sonoma Humane Society has been overwhelmed by the generosity of donations of pet food and other items, which are being distributed to displaced pet owners. It currently does not need additional supplies. “We are thankful for the outpouring of support we are receiving,” it stated on its website Oct. 12. Adopting a dog from the shelter to make room for incoming strays and injured pets. Making an online cash donation, which is especially needed and appreciated. “You can choose to restrict your gift to ‘NorCal Fire Relief’ or consider giving a gift to ‘Help where it’s needed most’ to ensure we have the resources to support our fire relief efforts as well as the animals who were already in our shelters,” Sonoma Humane said. The humane society is providing temporary housing for an evacuated pet hospital. “Several kitties have come to us with burned paws, but most of them are still purring and allowing us to love them up,” according to an update. Napa Humane also has a mobile unit available at the Napa County Animal Shelter and Adoption Center that’s being used to house evacuated pets. You can help by making an online cash donation. 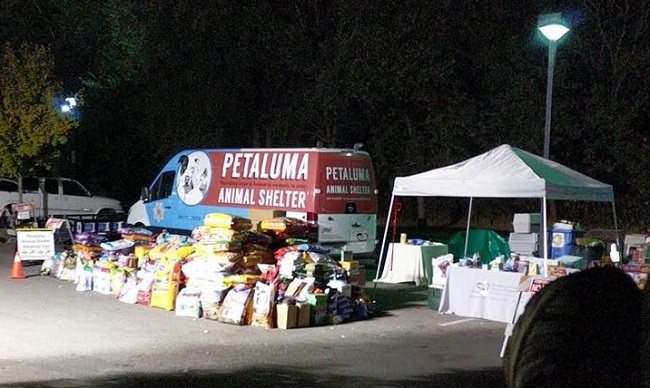 “Our employees are sleeping in their cars, rescuing in the fire area, staffing the evacuation center and handling the shelter,” Petaluma Animal Services reported on its Facebook page Oct. 12. As with the other animal shelters impacted, thanks to generous donations, Marin Humane currently has enough food and supplies. You can help by making an online cash donation so Marin Humane can continue offering free emergency boarding.